New Public Promenade Connecting Shelter Island to Harbor Drive Completed | United Development Group Inc.
Pedestrians and cyclists now have an easier way to get from Shelter Island to Harbor Drive, thanks to a new public promenade built by a longtime Port of San Diego tenant. The new promenade is located on the waterfront between Shelter Island and America’s Cup Harbor and provides a direct link from Shelter Island Drive to Harbor Drive. It was built as part of a new development called Intrepid Landing. The development is a partnership between Driscoll, Inc., which owns Driscoll Boatyard and Driscoll’s Wharf on Shelter Island, and William Ayyad, president and founder of United Development Group, Inc. Completion of the 700-foot public promenade was celebrated at a ribbon-cutting event Wednesday, December 12, 2012. Lou Smith, Chairman of the Board of Port Commissioners, joined Tom Driscoll, President of Driscoll, Inc., and several Shelter Island business owners in celebrating the new promenade. Intrepid Landing is named after the America’s Cup vessel skippered by the Driscoll Family patriarch, Gerald Driscoll, in the early 1970s. The new development includes a recently completed, 40-slip marina. A restaurant, commercial buildings and office space are also part of the project and are expected to start construction in January 2013. The entire project is estimated to cost $6.3 million. Intrepid Landing is designed by Miller Hull, a world-renowned architectural firm based in Seattle and with a San Diego office. The company is known for building legacy projects that are socially responsible. Miller Hull is also acclaimed for projects that incorporate simple, innovative and authentic designs. 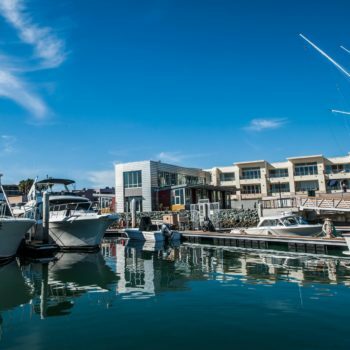 The firm designed the Pier 32 Marina in National City and the Point Loma Marina in America’s Cup Harbor. The Port of San Diego is the fourth largest of the 11 ports in California. It was created by the state legislature in 1962. Since then, it has invested millions of dollars in public improvements in its five member cities – Chula Vista, Coronado, Imperial Beach, National City, and San Diego. The port oversees two maritime cargo terminals, two cruise ship terminals, 18 public parks, the Harbor Police Department and the leases of hundreds of tenant and sub tenant businesses around San Diego Bay. The Port of San Diego is an economic engine, an environmental steward of San Diego Bay and the surrounding tidelands, and a provider of community services and public safety. This article was published by the Unified Port of San Diego on December 12, 2012.